An ICD compared to usual care will increase survival in patients with an EF 0.36 to 0.50, impaired heart rate turbulence (HRT) and abnormal repolarization alternans (TWA) measured 2 to 60 months after MI. • Compare cardiac death rates in ICD vs. control patients. 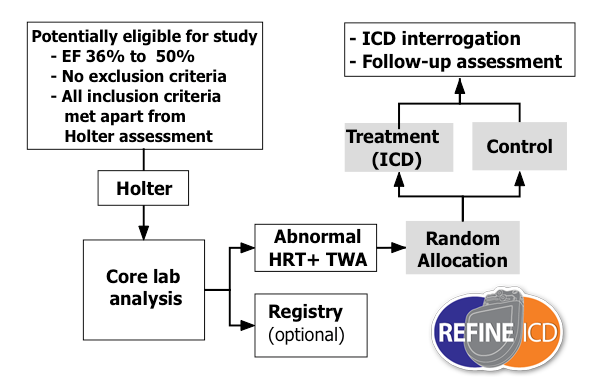 • Assess rates of appropriate ICD therapies in ICD patients. • Compare arrhythmic syncope rates in ICD vs. control patients. • Compare temporal patterns of health-related quality of life in ICD vs. control patients. • Evaluate the prognostic significance of DC, in addition to HRT and TWA.